Interests (rocketry): Mainly propulsion, but also aerodynamics and design. Lately I have started scaling military rockets for my high power needs (see picture below). Interests (non-rocketry): playing drums, reading, cinema, pyrotechnics, hanging around and goofing off with a bunch of friends, computers (using, not understanding, that is. For a better understanding, check out this site), hiking, deserts, skiing, snowboarding, watching Formula 1 races on TV. 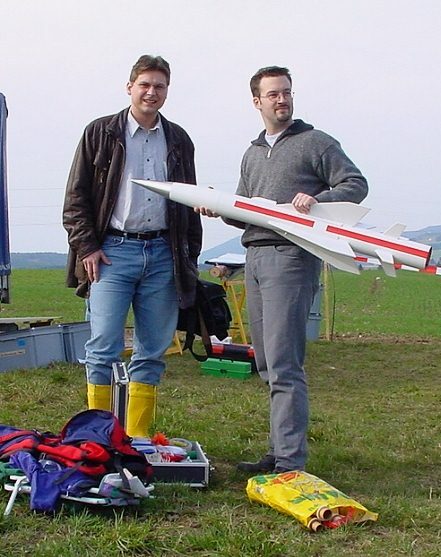 The guy with the yellow rubber boots is my friend Hendrik Lau (not merely an amateur rocket motor builder, as he's a real life rocket scientist and works for the DLR ). I'm the one holding the Kormoran missile. Absolutely useless info: Need some cheat codes for Earthworm Jim I (the best jump'n'run ever made)? Look no further! To get the codes working, simply type in the words once you have started the level. slaughterhouse: Lets you select one of the first five levels. This is especially useful as you normally have to finish one level in order to start with the next on.